Jo Tuckman had an engaging piece in The New York Times on Sunday, decrying the “lost years” of Mexican democracy and sounding some alarm about the likely return to power in Mexico of the Partido Revolucionario Institucional (PRI) when Enrique Peña Nieto, as widely predicted, wins the presidential election on July 1. How is it, then, that the party’s candidate, Enrique Peña Nieto, seems poised to win the presidential election next Sunday and become the leader of 113 million Mexicans? 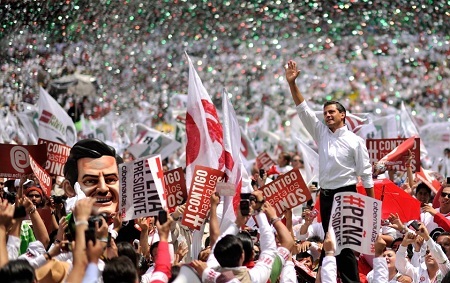 The answer is that Peña Nieto has run a much (much) superior campaign than Josefina Vázquez Mota, the candidate of the Partido Acción Nacional (PAN) or Andrés Manuel López Obrador, the candidate of the Partido de la Revolución Democrática (PRD). The PAN has held the presidency for 12 consecutive years, so it has taken the brunt of criticism over the Mexican economy, drug violence and the less-than-galloping pace of political and economic reform, even though it doesn’t control Congress, and the PRI and the PRD have opposed most of president Felipe Calderón’s agenda. For its own part, the PRD still isn’t truly a political presence in northern Mexico and López Obrador blew a huge lead in the 2006 presidential election and refused to cede the PRD’s shot in 2012 to the younger and more centrist Marcelo Ebrard. The PRI, of course, governed Mexico from 1929 until 2000, often with a healthy dose of authoritarianism, an even healthier dose of electoral fraud and a lot of government spending diverted to bolstering the party. For most of the PRI’s reign, it’s safe to say, Mexico was something short of a strict dictatorship (Mexico’s government had certain features that limited authoritarian abuse, such as a six-year term limit for Mexican presidents), but nothing like a liberal democracy. But Tuckman is wrong to call the last 12 years a lost opportunity, and she’s wrong that the impending return of the PRI indicates that Mexican democracy is in danger — if anything, the PRI’s return indicates that Mexican democracy is thriving. It would be prudent, of course, for Mexican civil society to remain vigilant for any signs of backsliding, and groups, such as the youthful YoSoy132 movement, are pressing this very point within Mexico. As it turns out, Televisa, Mexico’s largest television network, had been selling favorable coverage to Peña Nieto — in years past, the PRI may have gotten away with that; instead, it was plastered earlier this month across global headlines when The Guardian broke the scandal (back in 2000, Mexico’s oil company, Pemex, gave $140 million in loans to certain PRI-backed unions, who in turn donated the cash to the PRI’s then-presidential candidate Francisco Labastida, who still lost handsomely), embarrassing Televisa, the PRI and Peña Nieto. A lot of people think that 2000 — the year that the PAN’s Vicente Fox wont he presidency — marks the key transition for Mexican democracy. Fox’s election was indeed a landmark for Mexican democracy, but the real turning point came a bit earlier — in 1994. That year saw the election of Ernesto Zedillo, a technocratic PRI president who inherited a financial crisis on Day One from his predecessor Carlos Salinas, whose administration was marked by corruption from the very beginning — his election in 1988 is now widely believed to have been fraudulently stolen from the PRD’s Cuauhtémoc Cárdenas (by contrast, Zedillo won what was probably the first free and fair election in modern Mexican history). Zedillo marked a new breed of PRIista — an economic technocrat who was also interested in political reform. Salinas, for all his administration’s corruption, had delivered a more open free-market economy and the landmark North American Free Trade Agreement, and Zedillo, as well as Fox and Calderón more recently, and likely Peña Nieto too, are all open free-market champions. But it is difficult to see how Mexican democracy would have flourished without Zedillo’s zeal for political reform as well. For example, Zedillo eliminated la partida secreta, essentially a presidential slush fund that had been used for years to buy support for the PRI. He also passed key election reforms in 1994 and 1996 — the reforms strengthened the Instituto Federal Electoral by eliminating the PRI’s control over its board and granting the IFE more autonomy, established for the first time in Mexico a range of electoral violations, issued photo identification credentials to Mexicans and enabled faster election results. The 1996 reforms also provided for proportional representation in congressional elections and limited any single party’s maximum number of seats to 300 in the 500-member Chamber of Deputies — ironically, the difficulty in achieving an absolute majority has been one of the major reasons that the PAN has accomplished so little in the way of domestic reform in the past 12 years. Furthermore, Zedillo’s immediate recognition of Fox’s victory in 2000 marked the start of what was to become a casebook example of a peaceful transfer of power. Zedillo also presided over the PRI’s first presidential primary in 1999, dragging his party into a new era of Mexican democracy, as much out of necessity as anything else — at both the state and federal level, Mexican democracy was becoming a new reality. The PAN won its first governorship in Baja California Norte in 1989, but also the Jalisco governorship and the mayoral race in Guadalajara in 1995. The PRD won the first-ever election for head of government of the Distrito Federal (essentially, the mayor of Mexico City — it has held the office ever since). Notably, in 1997, for the first time, no single party won an absolute majority in the Congress. To be sure, democracy at the state and local levels continues to be uneven — even as some states paved the road to democracy in the early 1990s, some states, especially in the rural south, continue to function as PRI fiefdoms. The PAN and the PRD, however, have found creative ways to work together in the face of the PRI’s recent electoral resurgence — for example, a PAN-PRD coalition won the state governorships in 2010 in Oaxaca, Sinaloa and Puebla — three traditional PRI strongholds. Manuel Bartlett, the man who virtually defines “old-guard” PRI — he was a minister in the 1980s and early 1990s, then served as Puebla’s governor from 1993 to 1999 and bitterly opposed Zedillo and the reformers in the 1990s — lost the presidential nomination in 2000 to a Zedillo ally and left the party in a huff — he’s currently running for the Mexican Senate (of all things) under the PRD banner. The intraparty fight within the PRI had already been fought — and won by the reformers — before Fox was even inaugurated. And Fox, the living embodiment of Mexico’s nascent pluralistic democracy? To the despair of the PAN and Vázquez Mota, he has indicated his support for Peña Nieto, said that Peña Nieto’s win is inevitable, and he has argued that Mexican institutions are strong enough to endure the PRI’s return to power. And he’s right — Mexico is strong enough to have a PRI government in the 21st century without fearing that it will drag Mexico back to the worst excesses of the 20th century.